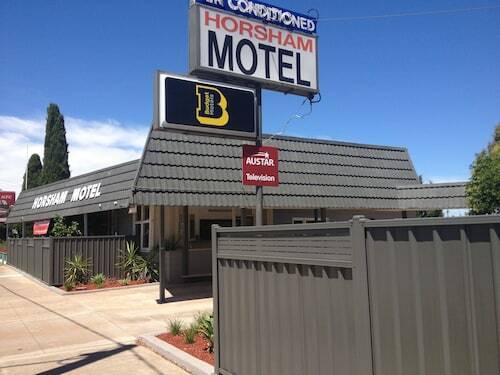 Situated in Horsham, this motel is within 2 mi (3 km) of Sawyer Park, Horsham Aquatic Centre, and Horsham Golf Club. Horsham Regional Art Gallery is 1.6 mi (2.6 km) away. Situated in Horsham, this motel is within a 10-minute walk of Horsham Aquatic Centre, Horsham Regional Art Gallery, and Horsham Golf Club. Sawyer Park is 0.5 mi (0.8 km) away. Located in the heart of Horsham, this luxury hotel is within a 15-minute walk of Horsham Regional Art Gallery, Horsham Golf Club, and Horsham Aquatic Centre. Sawyer Park is 1 mi (1.6 km) away. 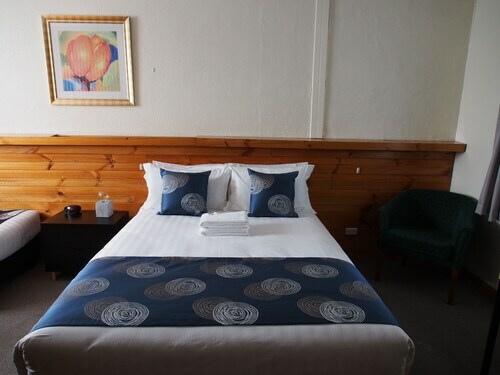 Located in the heart of Horsham, this motel is within 1 mi (2 km) of Horsham Regional Art Gallery, Horsham Aquatic Centre, and Horsham Golf Club. Sawyer Park is 1.2 mi (1.9 km) away. 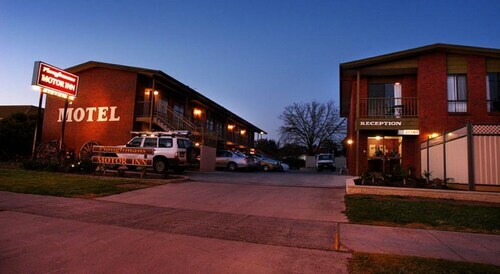 Situated in Horsham, this motel is within 1 mi (2 km) of Horsham Regional Art Gallery, Horsham Aquatic Centre, and Horsham Golf Club. Sawyer Park is 1.2 mi (1.9 km) away. 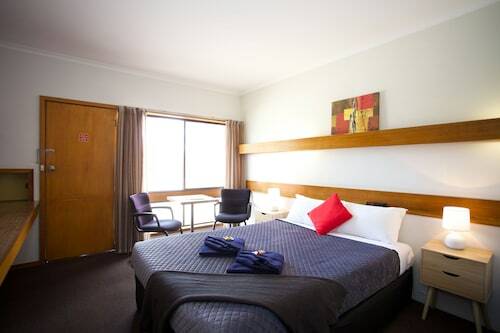 Located in the heart of Horsham, this motel is within 1 mi (2 km) of Horsham Regional Art Gallery, Horsham Aquatic Centre, and Horsham Golf Club. Sawyer Park is 1.3 mi (2.1 km) away. 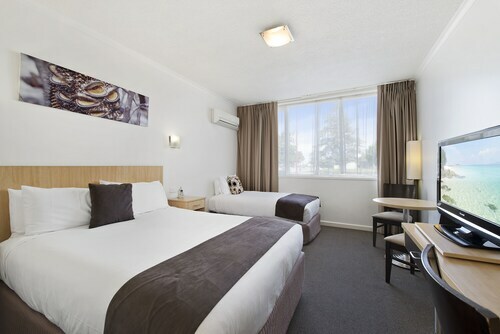 Situated in Horsham, this motel is within a 15-minute walk of Sawyer Park, Horsham Aquatic Centre, and Horsham Golf Club. Horsham Regional Art Gallery is 1 mi (1.5 km) away. 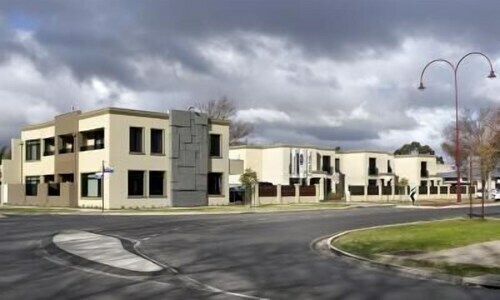 Situated in Horsham, this luxury apartment building is within a 15-minute walk of Horsham Regional Art Gallery and Horsham Aquatic Centre. Horsham Golf Club and Sawyer Park are also within 1 mi (2 km). Horsham is the biggest town in Victoria’s Wimmera Region, with a strong creative community, a friendly and relaxed vibe and plenty of things to see. Located on the banks of the Wimmera River, Horsham combines small town charm with exciting tourist activities and natural splendour. Book your Horsham accommodation with us and find out for yourself! The city centre is on Firebrace Street and its surrounding streets, and there you’ll find plenty of shops, cafes, and restaurants to choose from. For an air-conditioned mall experience, Horsham Plaza is the main shopping complex and has several big chain stores including a Kmart. Feeling sporty? Go for a swim at the Horsham Aquatic centre, play mini-golf or go ten-pin bowling. If you’re in the mood for something cultural, Horsham delivers on that front too with attractions like the Horsham Regional Arts Gallery. Opened in 1973 as a single room in the public library, it’s since grown into a flourishing art space specialising in Australian photography. There are several other art galleries in and around town including the Redgum Gallery and Natimuk’s Got Gallery. But the art in Horsham isn’t only in the galleries! Public sculptures such as Tim Jones’s Scar Tree and the mosaics by local schoolchildren add to Horsham’s unique creative feel. Wesley Performing Arts Centre, housed in an old church, regularly hosts music, comedy and theatre events. Every June the Art Is... Festival features ten days of exhibitions, performances, sound art and more, with the intention of bringing the Horsham region’s creative community together. Horsham is right in the thick of the Grampians’ acclaimed wine region. Visit a local winery to sip a nice Shiraz in a peaceful outdoor setting with views of the valley. The Botanical Gardens on Firebrace Street features rose gardens, a children’s playground and picnic facilities. The rest of the Grampians has an incredible selection of waterfalls, lookouts, amazing parks and attractions like Mount Arapiles, a 1,214-foot rock formation that looms behind the Wimmera plains. Go for a walk, or rock climb if you’re especially brave, to the very top of the mountain. For a more relaxing experience, head west to the township of Natimuk to see the main street full of historic buildings and craft shops. For a taste of country life with a flourishing arts scene and a host of activities, book your Horsham hotel with us and let your Grampians adventure begin! How Much is a Hotel Room in Horsham? Hotels in Horsham start at AU$88 per night. Prices and availability subject to change. Additional terms may apply. 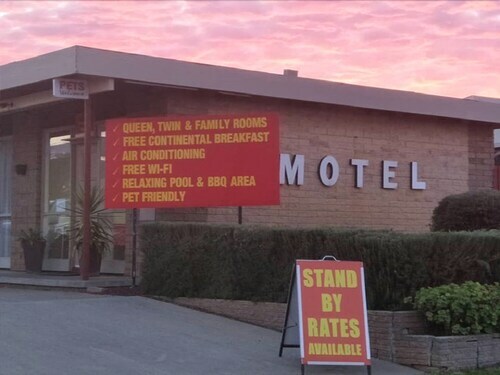 The Majestic Motel was great for a single person on a quick stop over enroute to Melbourne. It was simple but did the job. The room was small but did the job. Reception was helpful and friendly. Lovely staff. Very understanding of the needs of parents travelling with small children.